Many of us have a desire to know more about the generations that preceded us and about our roots. We may have become fascinated about where our family originated from; what it was that they did for a living and in what conditions they lived. If your forebears came from England & Wales, then you will want to know what records you can access and where to look for them. I am Nick Thorne, The Nosey Genealogist, and I have just published an amazon Kindle book called: How to Search for Your English & Welsh Family History. In it I lead the reader through some of the research work that you will probably need to undertake to pursue these goals. 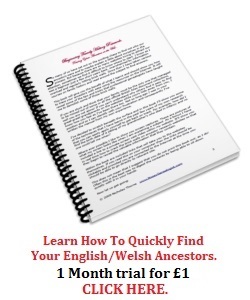 Assuming that you have a yearning to find out more about your British roots, this is a concise introduction to English & Welsh family history which can help you in your quest. I include a look at online and offline records,starting with the census collections and the civil registration data. Different types of Parish Records are dealt with in one chapter including the Dade and Barrington registers. If your ancestor is missing from the church records, then I explain where to find the Bishop’s transcripts and what these copies are. Baptismal, marriage and burial records are not the only records that were locked away in the Parish Chest and so I look at some of the other documents that may have survived. Researching records of a marriage and what a Clandestine marriage was are included in this short book as is an explanation of why your ancestor may have had a double baptism. Nonconformist, those of a Christian denomination other than the Church of England, and parish graves are investigated, as is researching records of a marriage, illegitimacy and stumbling blocks in the parish records. If you don’t have a Kindle then you can download Kindle for PC from amazon and read Kindle books directly on your PC! If you want a concise book on English an Welsh Family history then click the button to Buy from Amazon in the box below.